This is a map for the mission “Troy’s Last Battle” for Atlantica Online. The grid depicted is the same grid as shown when you press “M” inside the mission. I collected experience with trioing, duoing and now soloing this mission. It is quite nicely designed in my opinion. It seems to be very challenging at first but it is manageable, and the reward is great. Your task is to move forward, guarding the horse, and then – as always – kill the final boss, another incarnation of Priamos. When you at least duo it: Go forward and disarm traps as they come. When you have passed the first bridge try to keep on the right side. If you do it correctly you don’t aggro the evil arachne (cannon) there. If you do it very correctly you can even kill the one mob in the back without aggroing the mini-boss… Now kill the mini-boss and his minions and advance to the second bridge (E8). There you’ll get a little surprise: a second mini boss will spawn when the Trojan Horse reaches a certain point. By the way: when the Trojan Horse triggers a cut scene be sure to use the time as described here. Then advance further, destroying some mystic stones on the way, and kill the mini-boss and his minions before the gate. Don’t try to destroy the gate, that won’t work. What you have to do instead is to kill the gate keepers (marked GK). 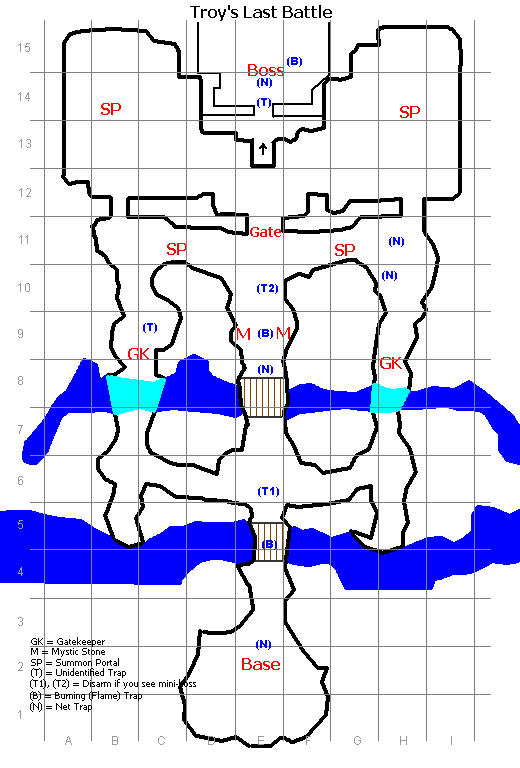 For that split, one group goes left, one right, take out summon portals and the gate keeper, and come back. Now the gate is open. The horse will advance further. You should try to clean the area around E12. Here Polyxena, another mini-boss, will spawn, and you are well advised if you try to let her spawn all on her own, without monsters helping her, because she can be nasty if tickled. Don’t bother about the summon portals in B14 and H14. It would be nice to take them out but the time lost there is too much. After Polyxena was elated by you to another plane of existence you will wait for the horse to reach the bottom of the stairs leading to the boss room. Some of you should guard this area because the summon portals in B14 and H14 will spawn mobs who have only one goal in their short life: killing the horse. The other somes of you should try to clean the boss room a bit. Kill the both catapults on the plateau at the top of the staircase, enter the boss room carefully, scroll away the traps and if your squad is good enough, try to take out the mini-bosses standing around. When the horse finally reaches the bottom of the staircase it will unload the final reinforcements and vanish. From now on you don’t need to bother about the horse anymore. Kill the boss. When we were in lower levels one cannon main went up and debuffed it (using devastation shell), dying in the process. That was a necessary sacrifice but when two sheriffs and one hwarang, all sethed, fired afterwards on the boss, he preferred to follow Polyxena. Not without uttering final sinister threats, of course. In the mean time I can solo it. There are two obstacles to overcome: 1. the darn horse, 2. time (thank God for being able to skip cut-scenes now after the Spelltower patch). The problem arises after you defeated the mini-boss at E10/11. Then you go either right, letting monsters leak out of the summon portal to the left which will without fail attack the horse eventually, or you go right and then the mobs from the left do the same. My current strategy is: Take out the summon portal to the left with oracle, cannon main and catapult, letting the sheriff stand at E11. He lays one or two net traps around the trees to the right of the (former) T2-trap to prevent rushes from the right summon portal killing him (see picture above). Then I go back with the whole party clearing out the summon portal to the right and the gatekeeper on this side. After that I go back to kill the gatekeeper on the left. That costs a bit of walking but it is reasonably safe. You will fail soloing this mission if your kill speed is too slow. I think a +10 dg or +10 evil gun is mandatory here. Here is a video with Fritz, musician main in lvl 130. Be warned though: For reasons explained in the video the resolution is only 640×480. ← What is this page about? there is no net trap @ H10. It is safe to hug the inner corner on way to the east gatekeeper without triggering the trap @ H11. The same applies to C11, the trap is closer to the western gate than the inner corner. T1 and T2 are in front of net traps. No trap found at boss area, maybe just flame that is triggered by non players. Didn’t need to use any scroll to disarm when engaging the final boss. But try to deviate into the corner and be surprised. I only killed one gatekeeper and could destroy the gate in F11. Is this a bug or a feature of the german version? We tried that a long time ago (before 3k patch). There it was not possible. I haven’t tried it since but will do that to check again. It would be a bug if it is possible, I think. There is no point of Gatekeepers who doesn’t keep the gate, is it? You can destroy the gate even without killing one gatekeeper, but you can’t finish the mission, cause no boss will spawn and horse will not advance further. You are stuck in the story (mission goals) until both gatekeepers are death. Ah, ok, then it is a waste of time but interesting to know nevertheless. – B11 has a net trap. I ran into it yesterday after I killed the mini and then ran South for the gatekeeper things. If you want the screenshot, I got it. – The traps in the Priam area: D14 and F14 are flame traps, they are next to the small light pillars there. The net trap is between the next two small light pillars, in the spot you indicated. So, it’s three and not two traps there in my experience. The screenshot would be nice. You’ve been talking about F8 and F12 but I think it’s supposed to be E8 and E12 since that’s where the bridge/area actually is, not on F.
I have recently tried to duo and failed due to lack of time. Would it be possible for one person to approach one of the gatekeepers from the bottom and kill him while the other person pushes middle? Are the gatekeepers in their place before you reach the gate and whether killing them before you get the mission would be an automatic fail? The main problems are not the gatekeeper but the group of monsters after the last bridge before the mystic stones and the two summon portals. The time you would save with pushing from the bottom instead from above you would easily spend again when you get to the summoned monsters – which are many more now since you engaged the gatekeepers before you have engaged the summon portals. Why do you lose by time? Where did you spend it? If one of you is enough to kill a gatekeeper you should be able to duo this mission very easily. Our estimate was: if you have 20 minutes left after the gate keepers are dead you will win the mission. After Polyxena I would guess 12 minutes. But you are right, that mission is time-critical. I want with a pair of friends. We had 2 witches, 2staff mains, 1 janissaries, 3 oracles and a sword main, all 115>lvl>120. Fully upgraded, all catapults bought, with feast and titles. we somehow managed (barely) to come to E12. Then mobs started coming and we couldn’t do ANYTHING. Its just too difficult for levels 115 unless you develop some strategy, which isnt worth as the mission is very long, difficult, costly and gives only 18 boxes (well its ok for a duo team i guess). My friend and I managed to clear the mission on our second attempt. This was our team: sword main, staff main, witch x2, oracle x2; full upgrades and 2 catapults. We were both level 120. I still had level 90 gear and he had level 100 gear. We went in with energizer title and nouvelle feast. Here are a few tips on how to finish this mission. -At the E8 bridge, lure the mini boss out of MS range with an ms. The other monsters should not get aggro. Once out of range, just finish it off quickly with sethed catapults. Proceed to clean the rest of the mobs with witches. -At E11 skip turns until you get two mobs coming out of one side from the SP. Take them out with sethed catapults and regular attacks. Position your witches at an optimal range. Run up with one of the mains just to disable the trap and then proceed with witches. Their meteor strike is capable of encompassing all of the major monsters by the gate. Finish them off with catapults. -There will be a ton of mobs at the SP, so you gotta make two trips with witches in order to take them out. -Approach the boss from the right side, don’t ms him until he comes to you. Trap the boss with your mercs and the fire 1 ms every two turns. The reason for that is so he stands on fire and takes additional damage. Not that one. But I am close with Fritz to do solo LB – that will be a one-part-video. cant watch the video in germany ..
U use any non licsence music? Yes, I accidentally did not remove the audio track. Corrected, the video should be working now. i already succes this mission countless number then suddenly when i did this again the trojan horse destroyed but i dont know what cause that…anyone experienced the same thing like me? I’ve tried running this TBS solo 3-4 times now, and each time something completely different happens. After killing Polyxena, mobs began to rush from both sides of the staircase…I’m talking about 1 Cannon (Reckless Arachne?) + 1 Mage from each side every 1 or 2 turns. Within 2 turns I was facing 6-8 cannon mobs + handful of mages…and lost. The mobs gather at the top left and the top right spawns. But sometimes they just don’t wander all at the same moment. That’s my experience. If you solo it, you should be prepared to them all rushing your way. Or you kill the spawns, which can be risky. 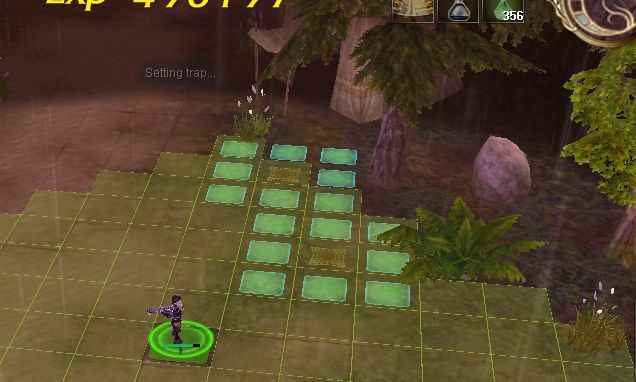 i confirm taht there are mini boss and nett trap in b11 area, i fail this mision because i dont know there are such a mobs in b11.